Cardiff sneaked a win at Southampton to edge to within three points of 17th-placed Norwich in the Premier League. The home side dominated possession and went close when a Gaston Ramirez shot was deflected onto the crossbar. But Saints struggled to make the most of their play and were punished when Juan Cala powered in a 22-yard effort. Cardiff endured a nervous finish and needed excellent David Marshall saves from Sam Gallagher and Nathaniel Clyne strikes before securing victory. Wilfried Zaha had the chance to ease Cardiff's anxiety late on but, after out-muscling Jose Fonte and sidestepping Dejan Lovren, his shot was saved by Paulo Gazzaniga. Nevertheless, the team with the worst top-flight away record before the weekend earned only their second victory on the road this season. The result also came on the back of a turbulent week for Cardiff, one which has been clouded by allegations of their team line-up allegedly being 'leaked' ahead of their defeat by Crystal Palace last weekend. Southampton beat Cardiff 3-0 in the reverse fixture on Boxing Day, but lacked the same ruthlessness on this occasion. "Cardiff are far from finished in their quest to stay in the Premier League. This was an unlikely and precious win - a first away win in 14 games since the end of September." The home side got into their smooth passing-and-moving stride quickly, only to be kept at bay by a visiting side defending deep and in numbers. Saints did almost find a way through when Adam Lallana played in Ramirez, but the Uruguayan's shot was deflected onto the crossbar by the outstretched leg of Steven Caulker. Goalkeeper Marshall has been one of Cardiff's better players amid a troubled campaign, and he was at full stretch to palm away a dipping 22-yard Rickie Lambert free-kick before parrying away a stabbed effort from the same player. Southampton had 66.4% of possession and managed 10 attempts on goal - four on target - in the first half, but the disciplined defending of the Bluebirds was keeping the game level. Cardiff's strategy was to try to catch Southampton out on the counter-attack, and the tactic almost reaped reward when Jordon Mutch raced at the home defence and had a 20-yard shot beaten away by Gazzaniga. However, that proved a warning sign that the home side did not heed as Juan Torres Ruiz, commonly known as Cala, scored the winner. The south-coast side cleared a corner only as far as the centre-back, who chested the ball down and sidestepped Steven Davis before sending a powerful shot past Gazzaniga. 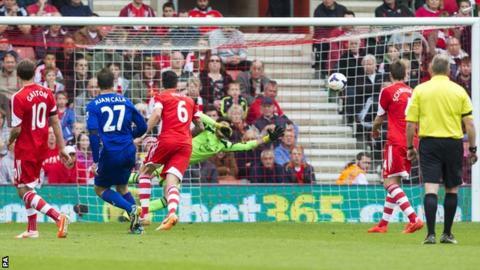 Southampton continued to apply the pressure on Cardiff's defence, and would have equalised had it not been for the impressive Marshall. Morgan Schneiderlin's chipped ball released Gallagher and his stabbed shot was saved by the Scot, who also palmed away a low shot from Clyne, before Bluebirds boss Ole Gunnar Solskjaer could enjoy his first away win in charge. "We are disappointed. If you analyse the game we didn't deserve to lose but it is a learning curve. "In football it's not just enough to play well. You have to be more clinical and aggressive and that is what we lacked. "We were dominating the game but in final third we were lacking the attacking edge we needed and their keeper was also making some outstanding saves." Match ends, Southampton 0, Cardiff City 1. Second Half ends, Southampton 0, Cardiff City 1. Offside, Cardiff City. Jordon Mutch tries a through ball, but Wilfried Zaha is caught offside. Corner, Cardiff City. Conceded by Jose Fonte. Attempt saved. Wilfried Zaha (Cardiff City) right footed shot from the centre of the box is saved in the centre of the goal. Assisted by Cala. Corner, Southampton. Conceded by Cala. Attempt saved. Guly (Southampton) header from the centre of the box is saved in the centre of the goal. Assisted by Luke Shaw with a cross. Corner, Southampton. Conceded by David Marshall. Attempt saved. Nathaniel Clyne (Southampton) left footed shot from outside the box is saved in the bottom right corner. Substitution, Southampton. Guly replaces Jack Cork. Substitution, Cardiff City. Kevin McNaughton replaces Fabio. Delay in match Steven Caulker (Cardiff City) because of an injury. Attempt saved. Sam Gallagher (Southampton) right footed shot from the centre of the box is saved in the centre of the goal. Assisted by Morgan Schneiderlin with a through ball. Attempt missed. Fraizer Campbell (Cardiff City) right footed shot from outside the box misses to the right. Assisted by Wilfried Zaha. Attempt missed. Adam Lallana (Southampton) left footed shot from outside the box misses to the left. Assisted by Rickie Lambert with a headed pass. Foul by Fraizer Campbell (Cardiff City). Corner, Cardiff City. Conceded by Luke Shaw. Substitution, Southampton. Nathaniel Clyne replaces Calum Chambers. Substitution, Southampton. Sam Gallagher replaces Gastón Ramírez. Goal! Southampton 0, Cardiff City 1. Cala (Cardiff City) left footed shot from outside the box to the bottom right corner following a set piece situation. Mats Daehli (Cardiff City) wins a free kick on the left wing. Substitution, Cardiff City. Wilfried Zaha replaces Gary Medel. Attempt missed. Rickie Lambert (Southampton) header from the centre of the box is just a bit too high. Assisted by Calum Chambers with a cross. Attempt saved. Jordon Mutch (Cardiff City) right footed shot from outside the box is saved in the centre of the goal. Assisted by Mats Daehli. Corner, Southampton. Conceded by Peter Whittingham. Attempt blocked. Gastón Ramírez (Southampton) left footed shot from outside the box is blocked. Jordon Mutch (Cardiff City) wins a free kick in the attacking half. Attempt blocked. Jack Cork (Southampton) right footed shot from outside the box is blocked. Assisted by Calum Chambers. Attempt missed. Morgan Schneiderlin (Southampton) right footed shot from outside the box is close, but misses to the right. Assisted by Adam Lallana.